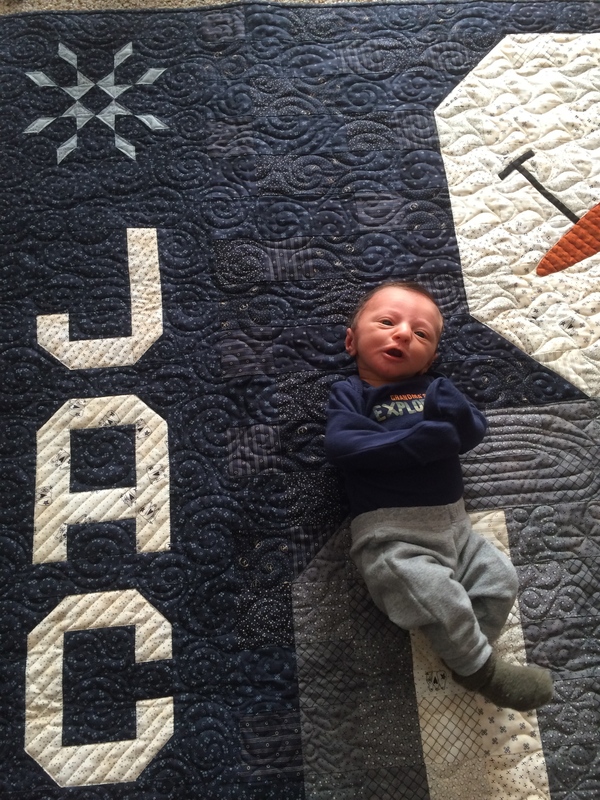 OK….I’m crazy “In Love” and I have to introduce you to my first grand baby…Jace James Neubauer…Born Feb, 3rd…6lbs 11 ozs and 19″ long…He is so perfect…a little man…who I just want to snuggle with…I finished his 2nd quilt and brought it over to him on Sunday to try out…I brought Great-Grandma Teri with and I didn’t like sharing!!! 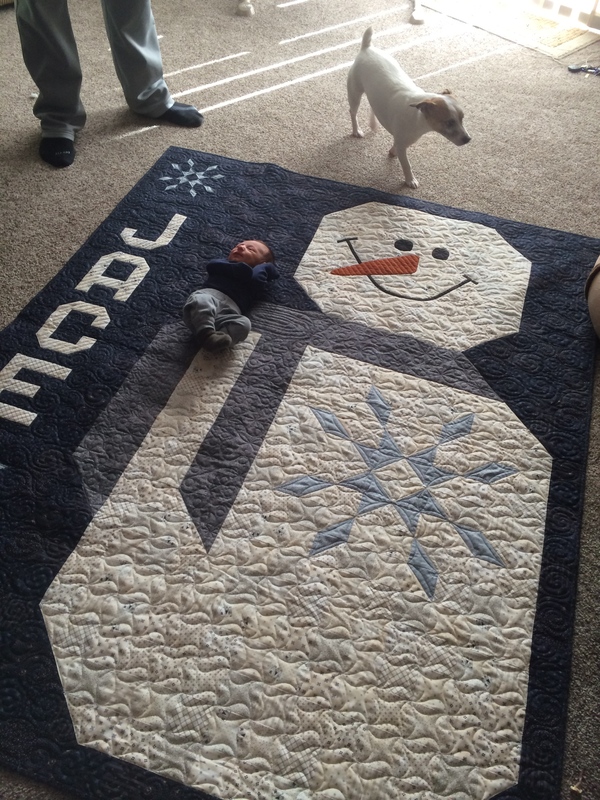 But “little man” seems to love his new snowman quilt…hopefully he will be snuggling on Sunday mornings at Grandmas house with it for years to come!!! He may have to grow into it…while it sells some kits and fabric for my newest line of fabrics from Moda…Snowman Gatherings II!!! Quilt is called Mr. Snowman…will be coming out in May 2015, quilted by Valerie Krueger LVegas, NV, who has a quilt in the current APQ magazine!!! Made from Homestead Gatherings YAY!! !…other quilt on the couch is Prairie Bride…Jake and Lauren’s wedding quilt. Jace’s little Buddie Romie…was very protective of his little brother…I’m sure you will be seeing lots of LM as he grows up!!! 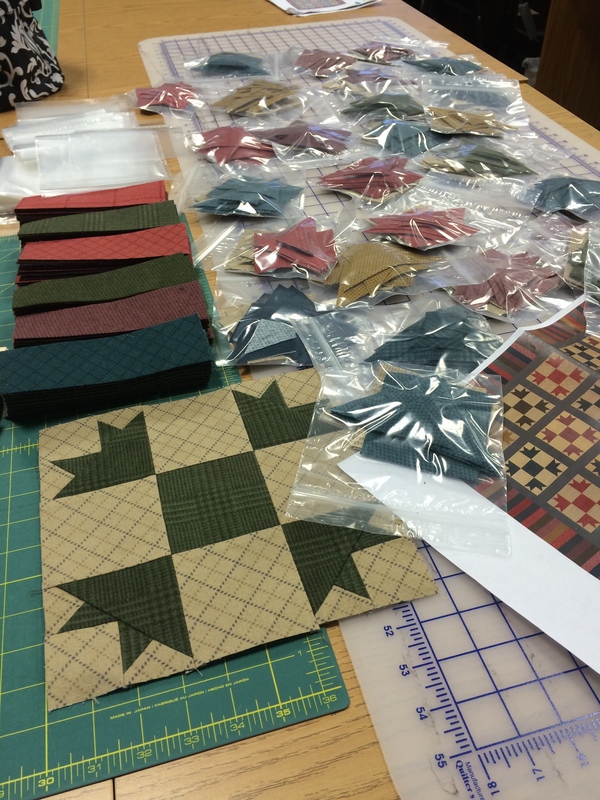 Last Pic…is my next flannel quilt…all 30 blocks cut packaged… test block done…now to piece away!!! Previous Post 2015 Designer Mystery BOM-Fat Quarter Shop!!! Oh my gosh, he is so adorable. And he looks so little on that quilt. And I love his snowman quilt. Congratulations to you and Nick and his momma and daddy!! He’s beautiful, Lisa! Congratulations on this new, wonderful joy in your life!! Congratulations to all! He is adorable! Looking forward to many more pics of LM! I knew it would be love at first sight Lisa…. 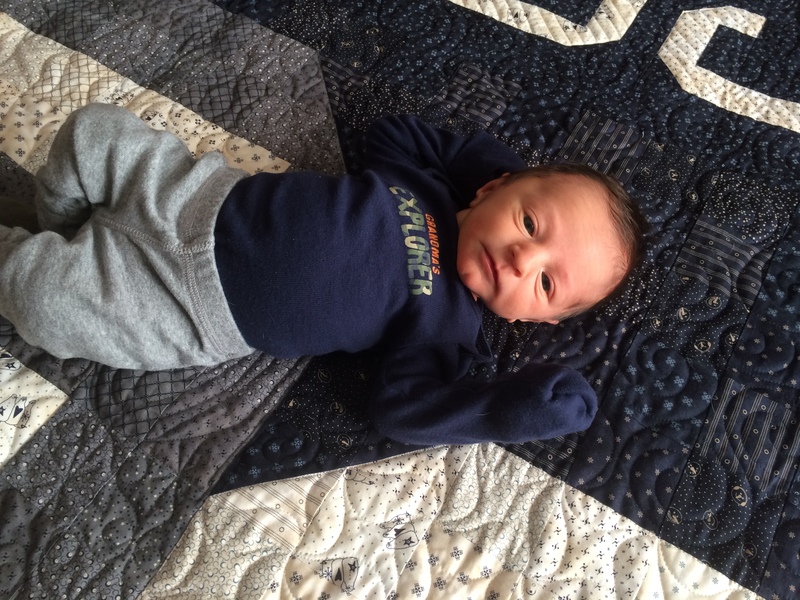 Enjoy him as much as you can while he is little… they grow up too fast… Congrats on such a beautiful grandson… he looks so cute on his quilt…. I look forward to watching him grow through your photos…. Congratulations Lisa!! Thanks for sharing him with all of us. congrats to everyone, enjoy every minute ,,,they grow up to fast,,, but God it’s wonderful having them around but hard to get anything done,,,but take the time you can’t get it back,,,, time only comes around once take it…have fun with all the changes as he grows….. Nothing better than being a grandma, is there? He is a doll, and so lucky to have that fun quilt to grow into. What a doll! Little Man is right! Jace is adorable, congrats to your family on this little bundle of joy!!! Congratulations Grandma Lisa! He is adorable! Love the snowman quilt too :). I was in Vintage Appliqué class at Road to California. I hope to get to your store soon! grandchildren are truly a gift! I know he will be the kid on the block with the most quilts! so sweet! Such a cutie and that dark hair!! Adorable! Love the quilt and the new flannel one you are working on, I will be making the snowman quilt when the fabric arrives. Happy snuggling..
Mr. Snowman is fabulous. I can’t wait for the pattern. And your new flannel quilt is going to be wonderful too. Lots of great things happening in your life. Toooooooo cute for words. Love him lots and give him lots of hugs and kisses. Congrats to all!!!!!!!!! Enjoy being Grandma and Grandpa!!!!! Jace is adorable, Lisa. I know you are SO happy. You and your family are so blessed and you are going to have the best time with him. Love the snowman pattern-nice size too. God Bless you and yours. Congratulations Lisa. I.m just in Love too with your grandson. And for sure you’ll be the best grandma and grandpa!!!!! He’s a huggable and look at that hair. On the quilt Jace looked like he had gained several pounds since birth but in Great Grandma’s arms, he looks like a little baby less than a month old. Have fun with him! Welcome to the “Grandma Club”! Congratulations to you and the family. 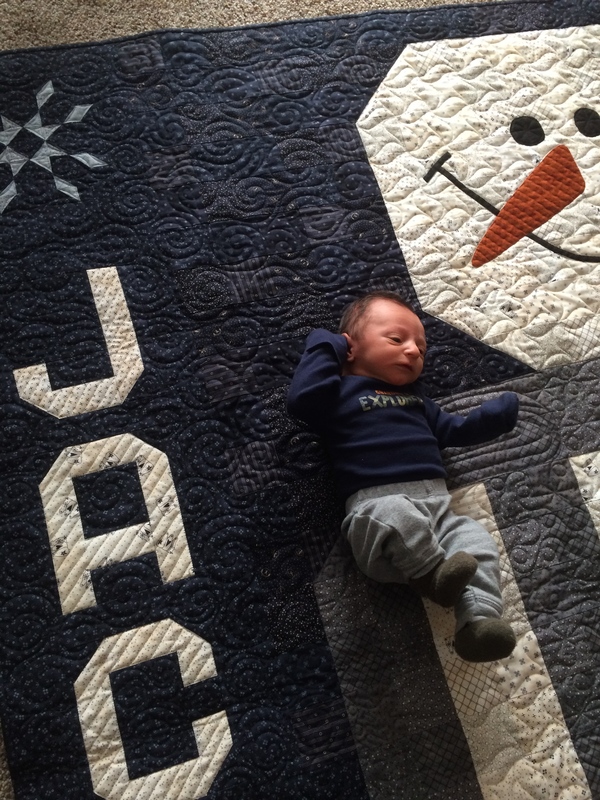 Jace looks so tiny on his beautiful quilt. Congratulations! Beautiful baby… Don’t blame you for not wanting to share him!! Love the quilt! 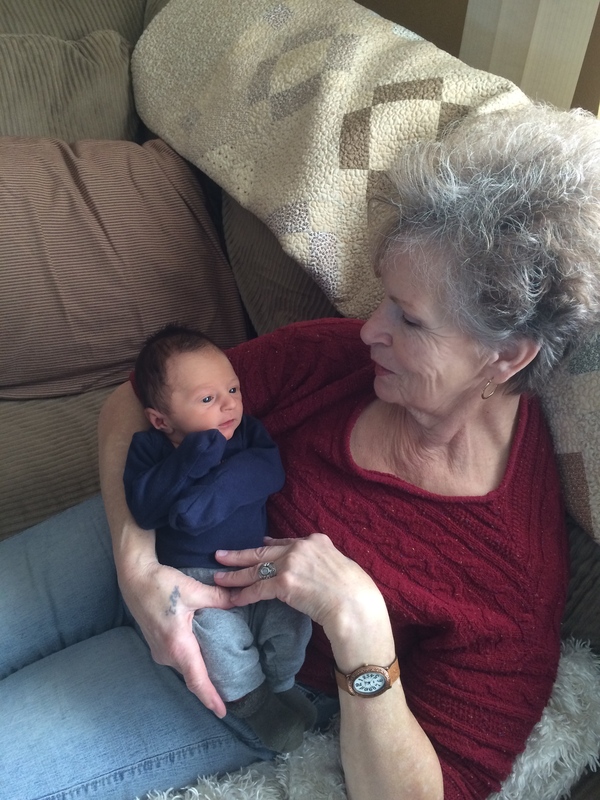 Congratulations grandma, Jace is beautiful. What a joy he will be. Love the snowman quilt and the flannel quilt pattern. Congratulations! I became a Grandma for the first time on January 28th and I refer to him as “little man” Tyler. Funny coincidence! Jace is beautiful and I know what you mean about being fully in love with him. I love the quilt and cannot wait until May to see all of the projects and the new fabric line. Lisa, I became a Grandmother for the 1st time, on Valentine’s Day! It’s a little boy, Kenton, and he is as cute as can be, and I never want to stop holding him. Right now I have to share him with his other grandmother, but she is going home soon (to a different state), so I am trying to be generous. (grin). Congrats on your new baby AND your beautiful new fabric line. Congrats on your precious grandbaby – what fun you’ll have! And love the quilt!!! Being a Grandma is the best thing in the world. Congratulations to your family. Little man is just adorable and those pics of him on his quilt – so sweet! Congratulations on the addition of ” Little Man” Jace to your family! He is a cutie as i’m sure you know !!! Love both quilts you posted as well. Enjoy him now as they don’t stay little for long ! Welcome to the grandparent club! It’s the best. So happy for your family, this little boy will be so loved ❤ The snowman quilt is beautiful. What an adorable baby. I am very happy for you. A grandchild is more love than anyone could imagine. I love my Snowman Gatherings one and am anxious to see the new set completed. Keep up the beautiful work! Congratulations, Grandma. Such a sweet little man. It will be so much fun for you to watch him grow up. Wonderful quilt just right for the baby. How wonderful! Congratulations to all of your family! Also, love the flannel quilt! Thanks for sharing those moments of family life. He looks to be a keeper! Oh, quilts look nice too, but Jace outshines them. I remember when you were working on the bride’s quilt at the gathering years ago. What a doll, love the pic with great-grandma. Thanks for sharing. What a beautifil “little man!” So happy for all of you! What a darling baby, all boy! Thanks for sharing, I’ve been concerned since you were in Cali when he was born. Glad to meet him, and the quilt is darling, as always. That flannel quilt looks amazing. Can’t wait! Welcome to your new world Lisa!! You will love and cherish every moment. He’s beautiful!!! I see why you call him “Little Man”, I can’t believe he’s only a couple weeks old. So much soulful expression in such a little face. I LOVE the pic with Teri!! Congratulations to you and your family!!! So happy for you all. Thank you for sharing Grandma!! 😊 ps. Your snowman qult is adorable! Congratulations–he is adorable! That snowman is pretty cute too! Congratulations on your adorable LIttle Man!! Nothing feels better or prouder than being grandma. Love the Snowman quilt and looking forward to the pattern on it and your new flannel. Enjoy that baby snuggle time!!!! Congratulations Lisa! He is adorable. I love the picture of Teri with him. I can tell she is enjoying holding him. It is hard to explain to someone how special it is to be a grandparent until it happens to them. You won’t want to be traveling so much cause every time you come home he will be so much bigger. Sweet!!!! He’s wonderful! Makes me even more excited, because my first grandchild is due in June! Congratulations! Congratulations! Enjoy every minute with your new love!!!!! So happy for you! Congratulations! what a sweetie. I can see why you don’t like ti share snuggle time with Jace. Love Mr. Snowman quilt too. P.S. His quilt is adorable! Congrats “Grammy” Lisa ! What a precious heart … Lots of fun ahead for you all ! Lisa I’ve never quilted with flannel. Does it roll on the edges or is it more like wool and stays flat? Do you have to use Steam-n-Seem on the back? Any other tips you could share would be appreciated. Lisa, he is beautiful! Congratulations to you and Jace’s parents. btw-the quilt is adorable! What an adorable “little man”. Congrats Gma !! His big snowman should bring him some very sweet dreams! 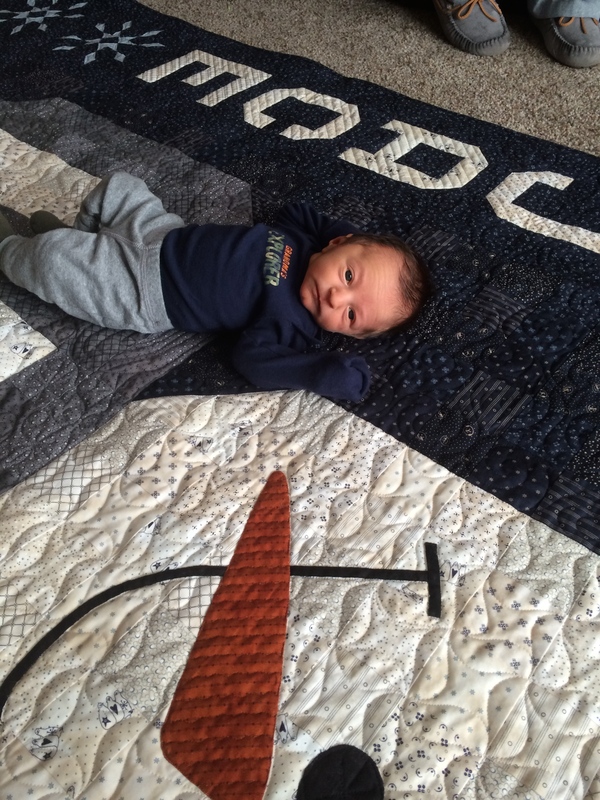 First, nice quilt, second, Beautiful baby! Gotta love that fresh newborn look! Sweet!